This 1901 novel delves into women's agency, desires, and yet again, the issue of income & poverty, and its effects on women in particular. I am a piece of machinery which, not understanding, my mother winds up the wrong way, setting all the wheels of my composition going in creaking discord. Fortunately for her, she's sent to live with her grandmother for a while. This is a much more civilized, luxurious life, and she enjoys it - the art and culture she's exposed to are just her thing. She enjoys being free from grinding labour, and likes feeling noticed and appreciated. She even draws the attention of Harold Beecham, an older neighbour, a single man who is a fairly successful farmer. But then she's sent home again (and this brief encounter with opportunity and glamour of a sort, followed by a return to poverty and routine reminds me of Stefan Zweig's The Post Office Girl, a harrowing book -- though Sybylla doesn't take the same way out). She must help the family out by working as a housekeeper for a nearby family, a job that clashes with her every instinct, so much so that she has a breakdown and must return home. At this point she receives a proposal from Harold, but refuses to take the easy way out and let a good marriage save her. She is going to save herself, and have the Brilliant Career she dreams of. This book also gives a strong picture of social conditions in rural Australia in the 1890s, in its casual descriptions of Sybylla's life. It's fascinating. It's also very interesting that Franklin was both pleased and taken aback by the success of this novel, and eventually withdrew its publication due to so many people assuming it was autobiography. It wasn't released again until after her death. 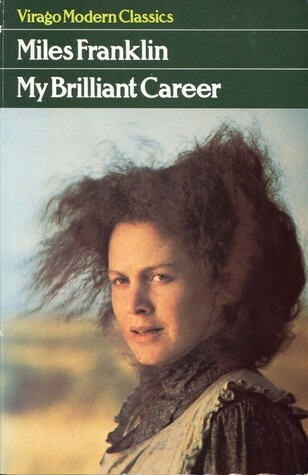 This book was also followed by a sequel, My Brilliant Career Goes Bung, which was written around the same time but only published in 1946 for the first time. If you like prickly characters and strong writing, I do recommend this classic Australian novel. There a lot of interesting commentary that is somehow still relevant to our lives. Strangely enough, Sybylla's sense of her self reminds me of two diaries published in the early years of the 20th century, both in her character and in the high literary style that comes through. Opal Whiteley's very popular The Story of Opal was told in a naive, childlike manner, while The Story of Mary Maclane was a bit darker and more desperate, but they were both writers who felt very out-of-place in their remote (US) communities. Sybylla is nowhere near as mannered and twee as either, but there are definite similarities. Yes, Sybylla is not exactly charming, but as an adult reader you can see her with some distance and understand her position a bit more, I think. Really interesting social commentary in this book. This sounds like a fascinating feministic novel, Melwyk. Terrific review! I'll keep this title in mind. It's definitely focused on women's experience, with a strong narrative voice.